Reality is a nasty creature though, and my fame and fortune as a musician failed to arrive. So this page is a wander down memory lane, to a time when my dreams were alive, but one never knows! 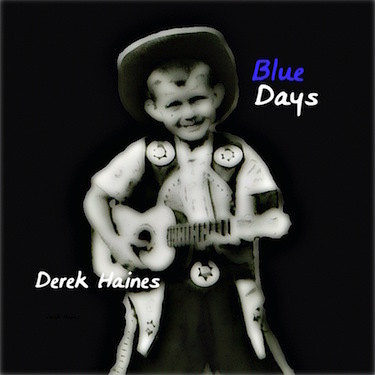 As you can see from the image on the cover of one of my less than successful CD’s, Blue Days, my strumming started at a very early age. Complete with a cowboy outfit. Once I had mastered the ukulele, I moved onto a cheap secondhand acoustic guitar until my teenage years, when I badgered my parents to death to buy me a cheap secondhand electric guitar. Later, when I left school and found a job, I was the odd one out in my group of friends. While they wasted their money on cars and girls, I wasted my money on buying guitars, amplifiers and songbooks. So, now decades later, this little page on the Internet is my musical museum. If you are intrepid and adventurous, here are some selected tracks for you to listen to. Be warned though, these songs are definitely not for lovers of Dean Martin. Somewhat surprisingly, some of my music still resides, noisily, in other locations around the Web, and in quasi video. A fascinating fact about recorded music is that it is tracked meticulously to ensure that artists are rewarded. To this end, I receive, without fail, my royalty payment every month. It amounts to cents, but hey, it’s the thought that counts! Now, here are a couple of links that prove I am (was) a potential musical phenomenon. I love the ones that are for CDs. Who buys CDs now? Well, at least a few tracks made it all the way to digital. Thank you for visiting the museum.